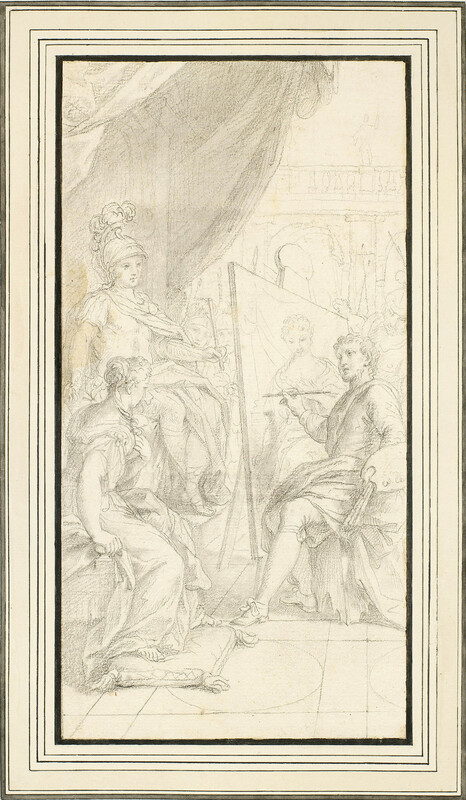 A drawing of Apelles at his easel as he paints a portrait of Campaspe, who is seated in the foreground on the left. Alexander the Great looks on from his throne behind the easel. Pliny the Elder related in his encyclopaedic Natural History – among many other things, our most substantial literary source on ancient art – a story of Apelles, court artist to Alexander the Great. Alexander asked Apelles to paint a portrait of his favourite concubine, Campaspe; but while doing so, Apelles secretly fell in love with her. Alexander intuited from the painting that Apelles’ love for Campaspe was greater than his own, so he kept the painting but magnanimously gave Campaspe to the painter. The episode combines themes of the power of art and the generosity of a patron, and in commissioning a painting of the subject a collector could demonstrate that he was conscious of both. This drawing by the Piedmontese painter Pietro de’ Pietri, active in Rome in the circle of Carlo Maratti, shows Apelles seated on a low stool before his canvas, with brushes and palette in hand. While Alexander and Campaspe are shown as standard types and in generically Antique costume, Apelles is given an individualised countenance and, other than the swag of drapery over his leg, is in contemporary dress, with fashionable shoes and a garter ribbon tied below his knee. It is not inconceivable that this was intended as a self-portrait of de’ Pietri: the heavy brow and downturned mouth are also seen in a more formal self-portrait drawing by the artist, though the small size of the head here makes it difficult to be certain.